Hope you’ve all had a wonderful week so far! 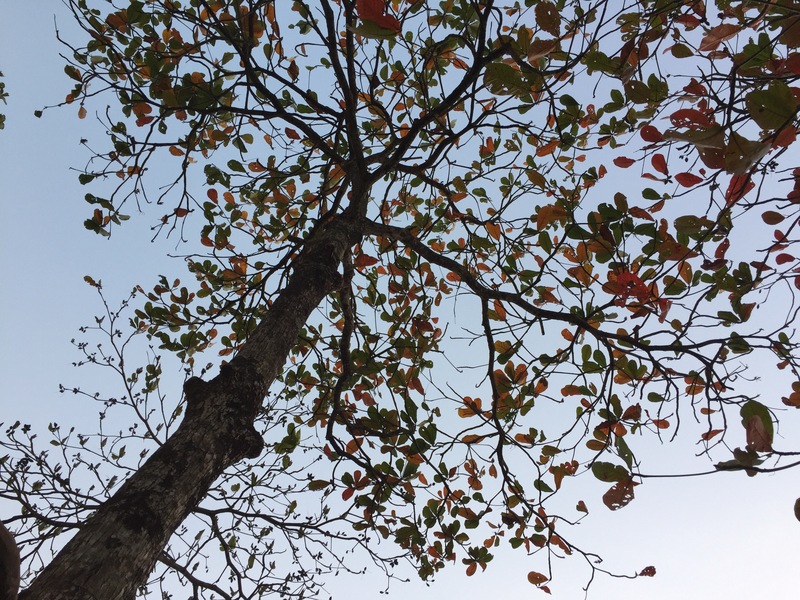 Last weekend we decided to do a short break over the Diwali holidays mainly to get away from the noise and pollution that makes it difficult for our son who suffers from asthma. 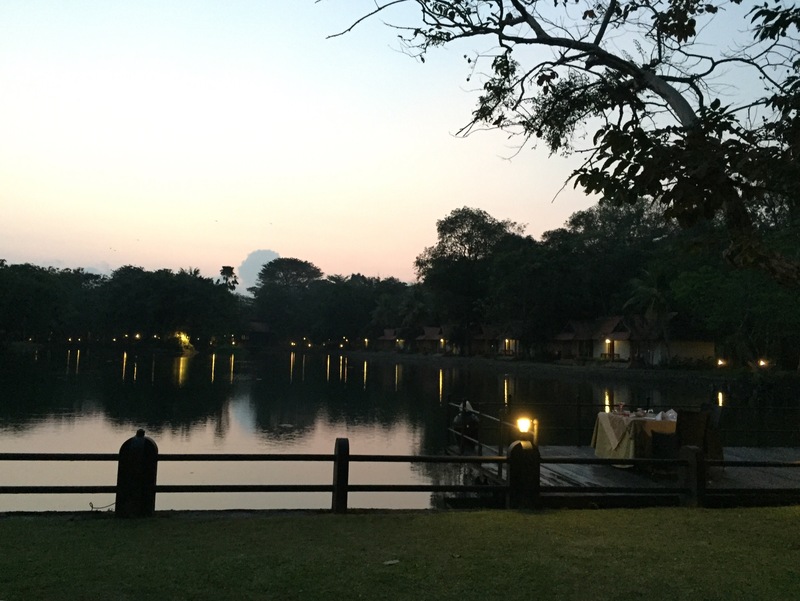 We were all excitedly looking forward to the few days at a quiet resort by the calm and serene backwaters in Kerala. Bangalore to Kochi by flight took an hour and a two-hour drive by road took us to Kumarakom by afternoon. 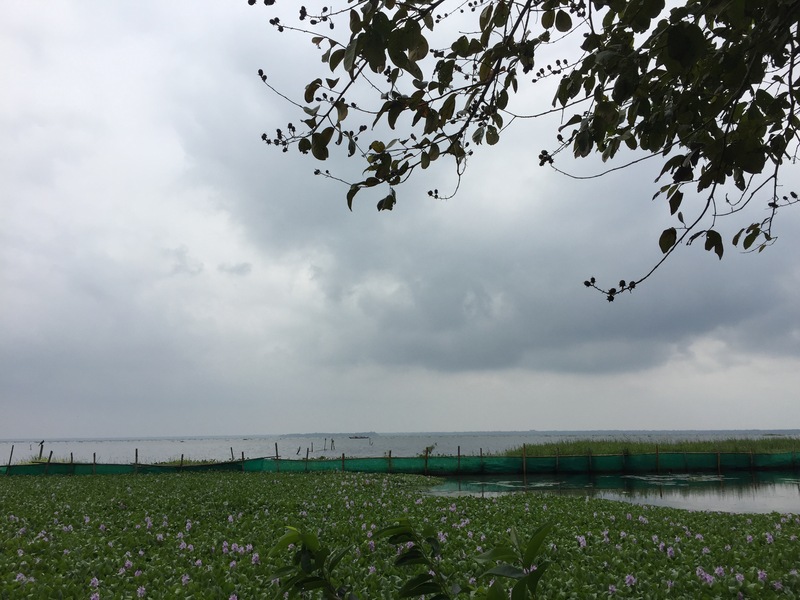 The weather being pleasant, the drive was quite comfortable as we found our way through small and big towns until we reached a point from where we caught sight of the beautiful Lake Vembanad. Needless to say, the view was so very relaxing! As soon as we reached, we were ushered in with a welcome drink of tender coconut water. Set on the shores of the Vembanad, the property is housed in a colonial bungalow built in the late 1800s. Most parts of the resort has now been renovated to suit modern requirements but the look has been retained to give it that old-world charm that draws large crowds to this place every year. As one of the best resorts in Kumarakom the place has a 150-year-old story to tell. The bungalow, built by English missionary, Henry Baker, is often called the little jewel of Kumarakom and the property still maintains the beauty of its rustic surroundings on the banks of Vembanad Lake. A short walk away was our room, located around a lagoon, which had stylish cottages and villas set like charming gems. After freshening up, we headed for a sumptuous meal of Kerala brown rice, that delectable vegetable stew and the famous fish curry, as we set off to explore the outdoors. 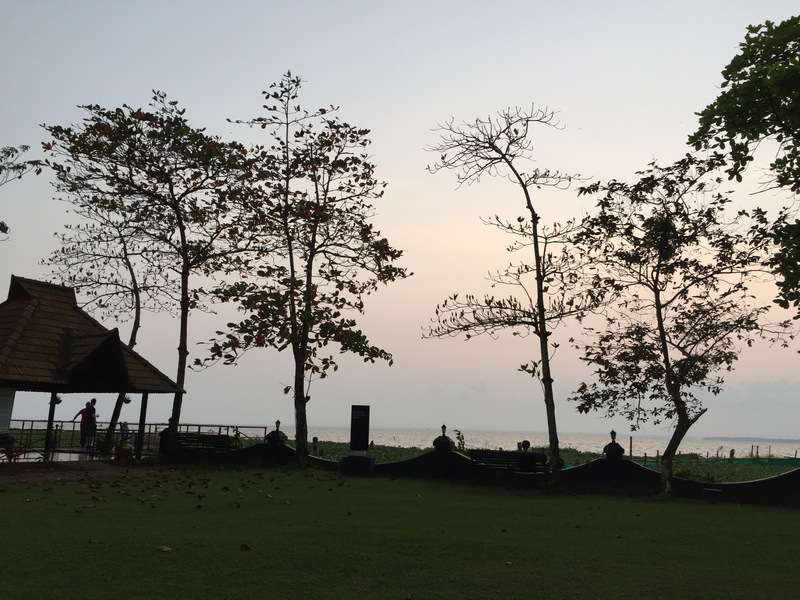 There were a plethora of activities to keep the kids and grown-ups occupied through the day which we promptly made a note of, before proceeding to do a quick walk up to the viewpoint to catch sight of the Lake Vembanad where it meets with the Arabian Sea. I’m sharing a few shots taken during that walk on Day one. The first picture is a capture of the tree-lined fringes of the Lake. The second shot is a bat hanging upside-down (see below right) from an Almond tree by the Lake-side. The third, yet another sky shot against the tree-covered silhouette. 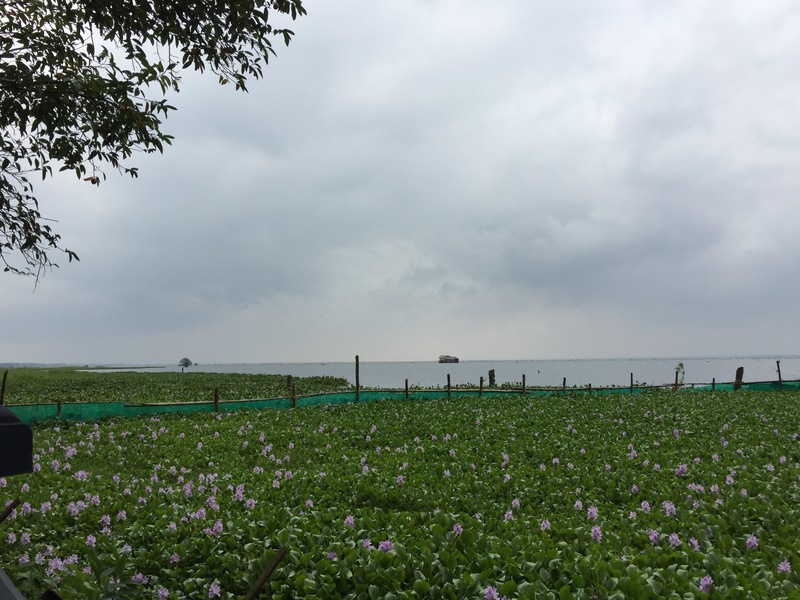 The sight of the mighty Vembanad was bewitching and humbling. It reminded me how puny we are before nature which can be so massive and so awe-inspiring. 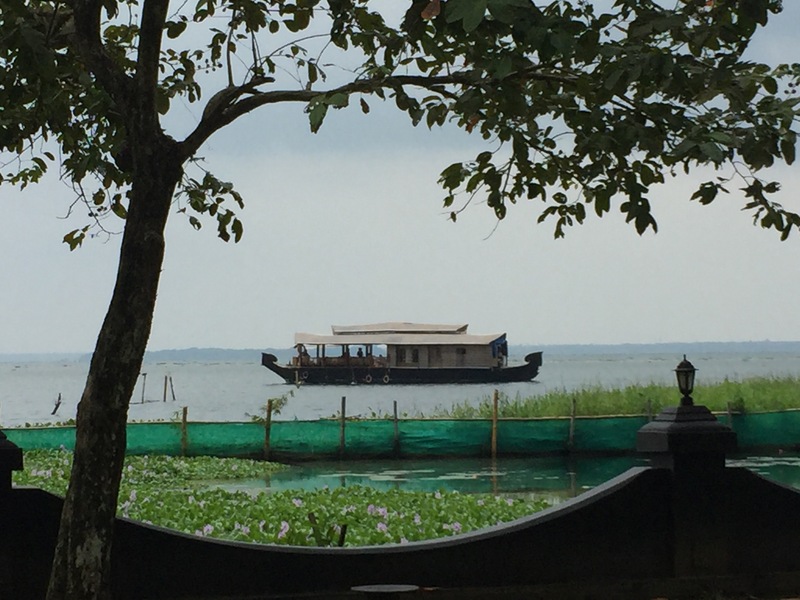 Here are a few shots of the Lake and the beautiful houseboats (called kettuvellam in the local language) sailing by gently. 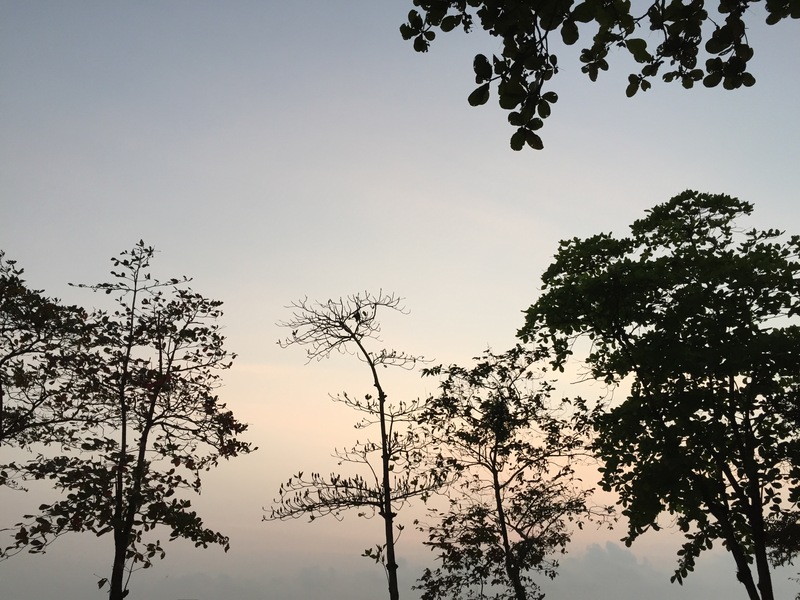 Later, that evening, as we strolled by the lawns near the lagoon, we had this amazing view at twilight – a clear sky softened by the fading daylight against a silhouette of trees. The serenity was all-absorbing. One could not stay unmoved by the aura of peace and quiet, away from the hustle of city life. I felt all my worries and stresses were moving miles away from me at that moment. Throughout the short break, I decided to practice mindfulness, living in and savouring all that was before me. At the end of those few days, I was feeling totally energised and refreshed, having stored enough calm and peace within me to last me a while. Nature always makes me feel connected to myself in this way. I think as the years go, this connection with oneself becomes more and more necessary. That is perhaps why I need to get away from the city and its noise every now and then, to recharge my batteries. How do you recharge? Do tell me how you found my sky shots for this week. I’d love to hear from you. To share your thoughts/comments/feedback, please do so in the comments section below. Joining for SkywatchFriday is great fun and very simple. Put together a few sky shots from your part of the world and post them here. There are loads of links to visit and comment over there, so don’t give it a miss. I was waiting for your sky watch post 🙂 It looks like it was a comforting and serene place. Maybe one day I’ll plan a trip there and take pointers from you 🙂 Beautiful captures. Just seeing the pictures soothes the soul in some way, I can imagine how wonderful it must have been in reality. Absolutely, Lata. One cannot but fall in love with such serenity and beauty. My fourth visit in 7 yrs and I love it here. You are so lucky to be here, Lata!! Lovely shots and gorgeous scenes. Nature does that to me too. So peaceful and serene. If I plan a trip that side, I will get in touch with you for more details. The place looks absolutely stunning. Thanks, Parul. I can tell how much you’ll love to soak in the peace in this place. Please do let me know if you’re looking for info, anytime you are planning a trip to the backwaters. I always tell people – “the backwaters keep calling me..” This was my fourth trip in seven years! Lovely pictures! I have skipped posting a picture for skywatch post this week! I do skip every now and then, so I guess it is ok.